Joseph Parry was born at 4 Chapel Row, Methyr Tydfil, on 21st May 1841. He was a pit boy at age 9 and an iron worker at 12. In 1854 the family moved to Danville, Pennsylvania where he worked in the rolling mills until 1865. 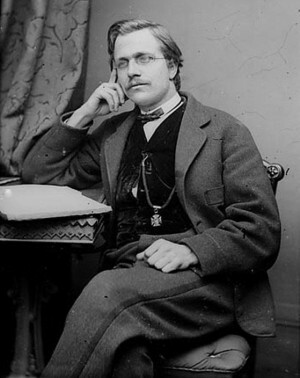 Joseph Parry came from a musical family and studied harmony in his spare time. There was a large Welsh community in Danville and he became involved in strengthening Welsh culture locally. In 1865 he was admitted to the Gorsedd at the National Eisteddfod and took the bardic name Pencerdd America. In 1868 Parry returned to Britain to study at the Royal Academy of Music (1868 – 1871). He returned to Danville where he established a musical institute. Parry returned to Britain again and studied music under William Sterndale Bennett in London and at the University of Cambridge. He was appointed Professor of Music at University College, Aberystwyth, a post he held from 1874 to 1880. In 1878 he gained the degree of Mus. Doc. (Cantab) and from 1881 to 1888 worked as organist at Ebenezer and as head of a musical college he founded in Swansea. From 1888 until his death on 17th February 1903 Parry was a lecturer in music at University College, Cardiff and lived in Penarth where he died at his home, Cartref. His musical works include operas, oratorios, hymns, anthems and instrumental works. Two of his best known works are Myfanwy and Aberystwyth which was used for the hymn Nkosi Silelel’ iAfrika. This later became the National Anthem of South Africa. Joseph Parry and his wife Jane knew great personal sadness with two of their sons dying before them. Joseph Haydn Parry, their eldest son died in 1894 at the age of 29. He is buried in Hampstead Cemetery in London. Their third son, William Sterndale Parry died at Cartref in 1892 at the age of 20. Parry died on 17th February 1903 following a short illness and is buried in the churchyard at St Augustine’s. More than 7,000 people from all over the country lined the streets of Penarth from his home to the Christchurch Congregational Church in Stanwell Road where the family worshipped and Parry played the organ. Parry’s monument is a white marble column topped by a 7-stringed lyre which represents the members of his family. Two of the seven strings are broken representing the two sons who died before him. Jane died on 25th September 1918 at the age of 75 and is buried with him.